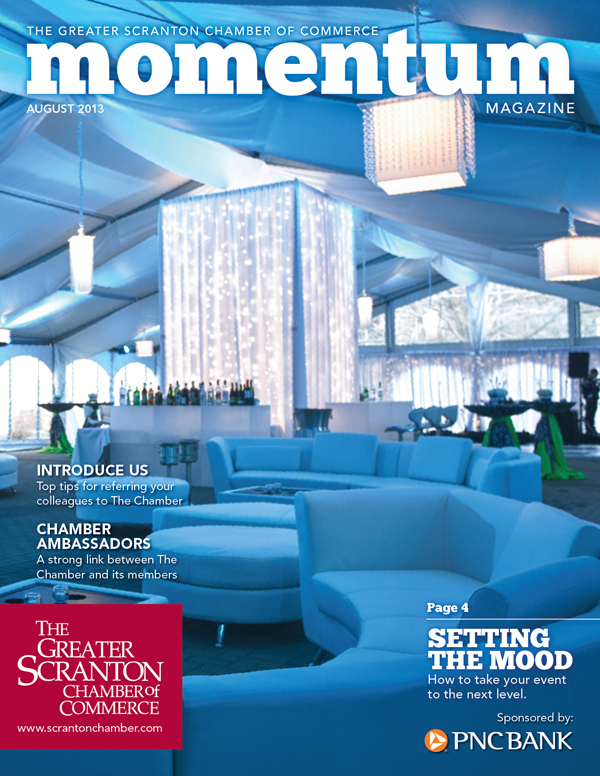 August marks the one-year anniversary of Momentum for both Blackout Design and The Scranton Chamber of Commerce! When the Chamber approached us to combine their already existing newsletters into one magazine, the goal was to provide a visually striking journal for its members to catch up on the latest news, as well as draw in potential recruits. Following a tidy re-design with Phil, the monthly publication was re-branded as “Momentum” and has been dispensing a mountain of valuable information, advice and stories ever since. As you can see by August’s cover, presently being built out by Jessica, the combination of eye-catching photography and compelling headlines makes this a nice piece for any member lobby or office. As always we’re happy to be working with the Chamber to further connect local businesses with one another and provide a valuable resource to its core audience. For more information, check out back issues of Momentum here!